With the wild weather around the state this week is was good to see some sunshine in Yarrawonga (between the hail showers….) and great to see our athletes perfroming so well right from the first race of the season. 4 athletes racing and 4 podiums which is a great return on their respective winter efforts. Congratulations to Yeatsy for taking out 1st male overall & first AG, Megan for 1st AG & 2nd female overall, Paul for 2nd AG and Tegan for 3rd AG! Special mention to Megan who has worked diligently, put in the hard yards and been challenged on a personal program with Coach Kat for the past few months – it is excellent to see this hard work paying off and we look forward to more success in the season to come. Backing up the Triathlon Jonney Yeates won the 5k run on sunday with Kat getting a 3rd. Well done all and we are excited for more racing soon – which is this weekend in Noosa!!! Read on below for all Noosa info including the training timetable and t-shirt orders. You may have seen on social media late last week but if you missed it we are very pleased to announce that we have joined forces with Orca Australia with them becoming our wetsuit partner. This is great news for our athletes in that you can get your hands on great products at a discounted 20% price (off rrp) with your athlete identification card. They have an extensive range of suits and depending on your swimming ability/requirements there will be a suit to match and with prices from $199 there is something for all budgets. The guys at Orca are located in Moorabin and have the facilities for you to pop in during business hours to try suits on and chat regards your requirements. They have a fully stocked warehouse and won’t have any issues ordering in your size if needed. You will see Santiago from Orca coming down to our Try the Tri sessions and demoing the suits so do pop along, say hi and check out the suits if you are in the market. We will also be scheduling squad demo sessions in the near future. We have 50+ athletes, friends and family heading up to Noosa this week for the Multi-Sport Festival which begins on Friday. We are very much looking forward to some warmer weather, great racing and some relaxation after it is all done and dusted. For those heading up make sure you are on this Facebook group for all things Noosa. We will be communicating any updates, meeting points etc through the week. the timetable for the week is posted but also below (subject to change). Also for those who have ordered the Noosa Supporters Tees these will be available in Noosa either from Ollie’s or when we put the tent up on Saturday morning. Wednesday 26th – 16:30 – OW Swim – meet beach side of the Life Saving Club. Thursday 27th – 06:00 – Bike course ride – 30/40k – meet at the roundabout/transition exit at the start of the bike course. Thursday 27th – 16:00 – Run- meet at the roundabout/transition exit at the start of the bike course. Friday 28th – 05:45 – Bike course ride – 30/40k – meet at the roundabout/transition exit at the start of the bike course. Optional for those who rode on the 27th. Friday 28th – 08:30 – OW Swim – meet beach side of the Life Saving Club. 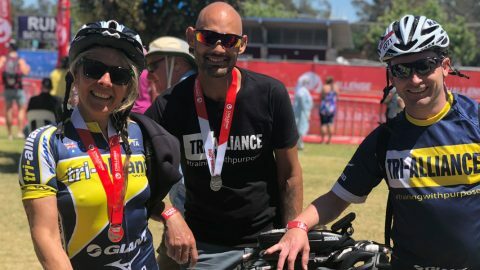 Saturday 29th – 07:00 – Ride the run course, short run off the bike, and then help put the Tri-Alliance tent up – meet at the club tents area, Laguna Park (just over the bridge from the start of the bike course). Asics Noosa Bolt – 16:00 – Cheer on our very own Jonney Yeates racing. Post your race come back to the tent where you can have a drink and support those out on the course. Monday 31st – Recovery and Mad Monday at Life Saving Club…..
Tuesday 1st – Recovery Ride – 7am meet at the roundabout/transition exit at the start of the bike course. We will ride a different way as we’ll have had enough of the course now! Followed by an optional swim. We had a great turn out for our first session of our first Try the Tri program for the 2016/17 season at Elwood on Saturday morning. With 30+ athletes getting the low down on what to expect during their 6 weeks, asking plenty of questions and getting a demo and intro from Orca it was a good start to the program. This Thursday they will be back in force at Elwood and taking on the bay for the first time. If you are around training to take time to say hi and make them feel welcome. We were all there once taking our first tentative steps. Our Falls Creek altitude camp is back and even bigger this year spanning the end of December and into January. This 12 day camp open to all athletes is flexible having a daily rate enabling you to manage your busy New Year schedule. At $99 per day including accommodation and training this is great value and staying at the Geelong Ski Club lodge gives fantastic access to the surrounding rides and trail runs. We have only 15 SPOTS AVAILABLE at the lodge so get your spot reserved. For more information and booking go to the Tri Shop below. Are you a member of our Strava Club? Upload your data, see what others are doing and give Kudos to others in their training. Weekly leader boards and training session details can be analysed for those with a data nerd head going on – and that is many of us! Your Garmin data can be automatically synchronized across so no hassles or manually uploads. To join the club select the image below or select this link. Many members look forward to the annual Hell Week and it is only just around the corner….We can confirm that Hell Week will be from the 17th December through to the 24th December. A full 8 days of a ride, run and swim everyday (if you can!). This is a specific training spike replacing normal sessions starting each morning with a ride, a run off the bike followed by an open water swim. Distances are set according to abilities but the key is to see if you can do some everyday – this may be a 40k ride a 2k run and a short swim but that is fine and you’ll be much stronger and ready for the bulk of the season post Christmas. More details will be released nearer the time but get it in your diary. DELIVERY UPDATE: We have been informed that these suits should be ready in time for Noosa so if you have not ordered get in quick. The Tri Alliance Trisuit for 2016 is the best ever! And by the number of pre-orders taken with names across the back you want it now! Production is currently underway so if you wanted your name on it and didn’t get the order in unfortunately you missed the boat. We have spent months on developing this suit with several samples and extensive testing to make sure both the quality, comfort and usability of the suit is of the highest priority. Race season is almost here for many so much more racey sets will be in sessions as well as building runs off the bike and open water swimming. Make sure you check the timetable and ensure you are well prepared to push yourself. Note Next Tuesday (1st November) is Melbourne Cup Day so no sessions will be taking place. Fridays at MSAC now have 3 lanes at 5:45am available for all again with 2 coaches. St Michaels Swims returns tonight with sessions on a Monday and Wednesday at 7pm and are primarily focused on our new Try the Tri crew. We shall chat with relevant athletes regards who should be attending these sessions in due course. Do ask if you have any questions. Thursday morning hotlaps non-coached this week as recovery week. LAPS SAFETY NOTE: On the subject of our laps session around Albert Park we have been aware of a number of accidents that have happened recently. Keeping off the painted lines especially in the wet is important and even when dry taking corners too fast, too tight and not paying attention can be dangerous. Please be aware, be alert and treat all sections of the circuit with respect. Saturday’s ride will be rolling from Elwood at 6:30am with various distances accordingly to race and ability. Long course riders this will be your long ride with a run off the bike. Short course this is your combo set beginning with a race specific ride followed by run and swim. We will also be starting to practice transitions with racks so T1 and T2 are smooth and fast as possible. Bring everything to this session. No coached run tomorrow morning at MSAC (25th) as it is recovery week. Sunday runs in October will be at either Fairfield (trail running) or Elwood both at 8am for all athletes. For all the following races we will have coaching support with you at the race venue on the day, some days leading up to and where possible race day tents. We are committed to the success and enjoyment of our athletes so want to help in any way we can. Last year Coach Ollie traveled to many races giving last minute tips and confidence boosters to those racing which was greatly received and helped many athletes. As well as support on race day we have created a number of Facebook groups for some key races so you can hook up and know who else is training for the same event. Banter, training tips, meeting points and social interaction are all welcome! Fore more on this, detailing when and where click this link. 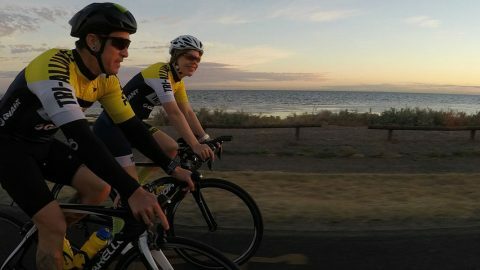 CHALLENGE SHEPPARTON – ENTRIES OPEN NOW for Nov 13th 2016. CHALLENGE MELBOURNE ENTRIES OPEN NOW for APRIL 9th 2017 – Get in now and plan your season with the final Victorian domestic long course race of the season. ADVENTURETHON – Fancy something different then check out the Anglesea event over the 3rd and 4th December 2016. Ride, run, swim, mountain bike, kayak. Entries and info here. SUFFERFESTS – Mount Martha, Ngambie and Warnambool for the 2016/17 season are hosting ever popular events from enticer to half distance. Check out the links for more info.